J. Geils Band, ‘One Last Kiss’ (‘Radio & Records’ magazine, January 19, 1979). Click to enlarge. 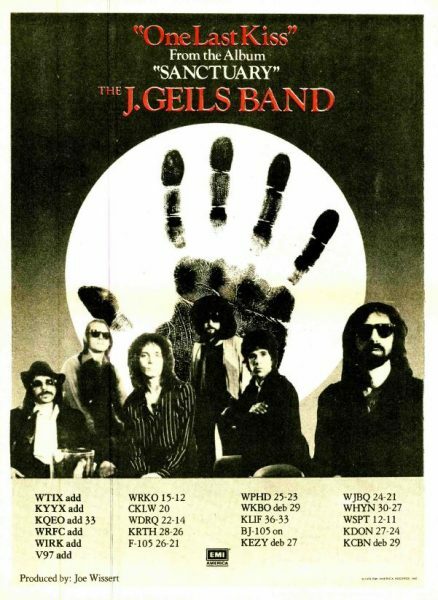 “One Last Kiss” by The J. Geils Band first appeared on the Sanctuary LP in the fall of 1978. The tune was written by group members Peter Wolf and Seth Justman and climbed to #35 on the US Hot 100 and #74 in the UK. Below, you’ll find a high quality performance shot in Germany in ’79.